BIRMINGHAM, Ala. - The Birmingham Barons are set to host the Biloxi Shuckers, Double-A affiliate of the Milwaukee Brewers in the first homestand of the second half of the season. 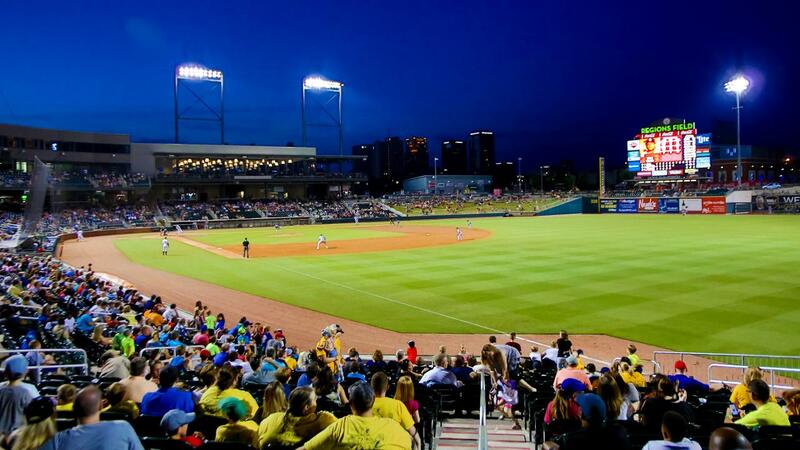 The Barons and Regions Field will be hosting Peanut-Free Night on Wednesday. The entire stadium has been thoroughly cleaned and nothing containing peanuts will be allowed or sold in the stadium. In addition, The SwitchYard On 14th will be open before, during and after games all homestand for fans to enjoy a game of ping pong or bocce ball as well as a drink from the Barstream or some of the new menu items featured in the Foodstream. Here is the full schedule for the homestand. Wednesday, June 28, 7:05 p.m. - The Barons and Regions Field will be hosting Peanut-Free Night presented by Alabama Allergy & Asthma Center for the first game of a five game series against Biloxi. The entirety of Regions Field has undergone a thorough cleaning to remove peanut residue in order for fans with peanut allergies to be able to enjoy a game at Regions Field. Nothing containing peanuts will be allowed or sold in the stadium. Wednesday night is also AAA Wednesday presented by AAA of Alabama. Show your AAA card at the box office and receive two dollars off a regular priced ticket. The executive entry opens at 5:30 p.m., with all gates opening at 6 p.m. The SwitchYard On 14th will be open beginning at 4:00 p.m. and remain open following the game until 10:00 p.m.
Thursday, June 29, 7:05 p.m. - Join us for another Thirsty Thursday presented by Miller Lite, Woodbridge and Buffalo Wild Wings, where you can enjoy two dollar drink specials on domestic beers, wines and soft drinks. The executive entrance will be opening at 5:30 p.m. and all gates opening at 6:00. Enjoy food, drinks and fun at The SwitchYard On 14th which will be open beginning at 4:00 p.m. and staying open all day, closing at midnight following the game. Friday, June 30, 7:05 p.m. - Add to your 3-D Stadium Collectible Series with the second of the three 3-D Stadium giveaways. The first 1,000 adults 13 and over will receive the Hoover Met collectible model presented by Coca-Cola. Friday night is also Used Car Night, presented by Jim Burke Automotive, where all fans 21 and older will be eligible to win one of four car giveaways. Cap off the night with another Friday Night Fireworks, presented by Hibbett Sports, Alabama Power and Coca-Cola. The executive entrance opens at 5:30 p.m., with all gates opening at 6:00. The SwitchYard On 14th will open at 4:00 p.m. and remain open leading up to and following the game until midnight. Saturday, July 1, 6:30 p.m. - Break Dancing bat boy Breakin' B-Boy McCoy will join us for another installment of the Saturday Entertainer Series presented by CBS 42, Red Diamond and Levy's Fine Jewelry. The first 1,000 fans 13 and over will also receive a 1948 Barons Replica Jersey presented by Birmingham Association of Realtors. The executive entrance opens at 5:00 p.m., with all gates opening at 5:30. The SwitchYard on 14th will also be open from 4:00 p.m. until midnight. Sunday, July 2, 3:00 p.m. - All active or retired military members can receive two dollars off a regular priced ticket by showing a valid military ID at the box office on Salute to Armed Forces Sunday presented by NAPA and Marion Military Institute. The first 1,000 fans 21 and over will also receive a 2018 Southern League All-Star Game T-Shirt presented by Wind Creek Casino and Hotel. The executive entrance will be opening at 1:30 p.m. and all gates opening at 2:00. Enjoy a meal at The SwitchYard On 14th which will be open beginning at 2:00 p.m. and staying open all day, closing at 9:00 p.m. following the game. Monday, July 3, 6:30 p.m. - We wrap up the six game homestand against Biloxi with our Independence Day celebration, which includes Patriotic Fireworks after the game presented by HealthSouth. Jake the Diamond Dog will also make his second and final appearance at Regions Field this season. The executive entrance will be opening at 5:00 p.m. and all gates opening at 5:30. Enjoy a meal at The SwitchYard On 14th which will be open beginning at 4:00 p.m. and staying open all day, closing at midnight following the game.